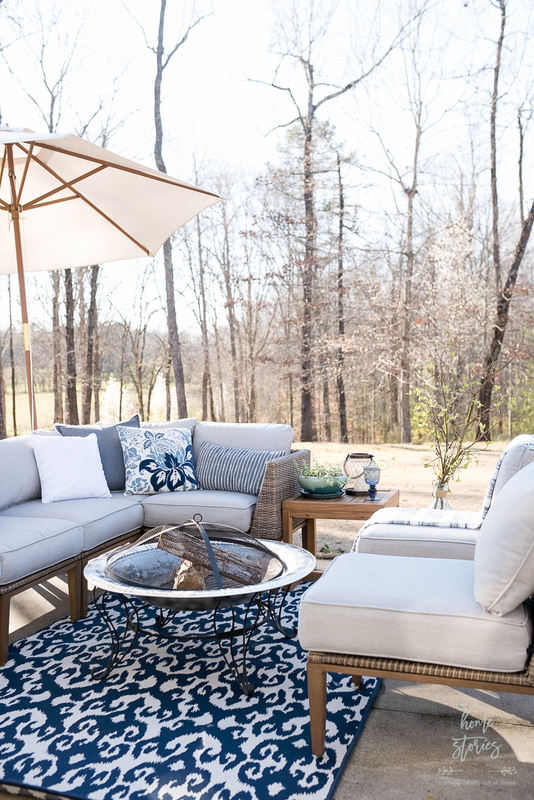 Summer is right around the corner and it’s time to spruce up your outdoor living spaces! 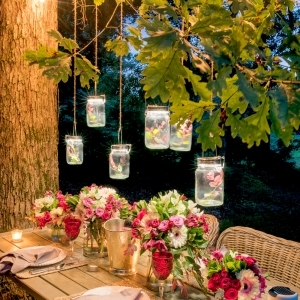 Creating outdoor areas you love isn’t difficult, but it does take some planning. 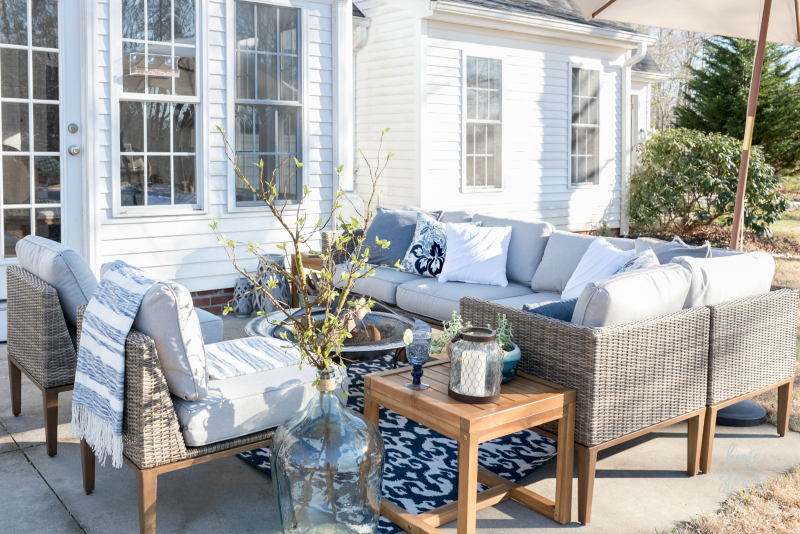 Follow these simple tips to learn how to create a beautiful outdoor living space you’re sure to enjoy all season long. 1. Decide how you want to use the space and select furniture accordingly. To feel cozy and intimate. To accommodate seating for at least 6. To be neutral in color for changing decor. 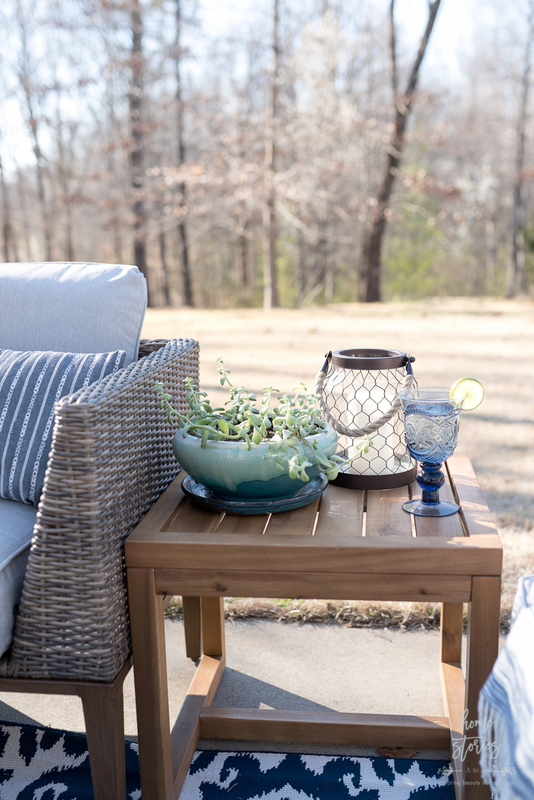 After reviewing my list, I began browsing outdoor furniture from Better Homes & Gardens on Walmart.com and was thrilled to see all of the great options! You can scroll through some of my favorite picks below. 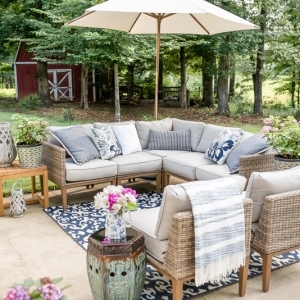 I settled on the mix and match Better Homes & Gardens Davenport 7-Piece Woven Outdoor Sectional Set which includes adjustable seating in all-weather wicker and two acacia wood tables. I love that the tables can be used as end tables or pushed together to create a coffee table. The legs of the sectional are painted to look like the acacia wood but are actually sturdy metal. I also bought the Better Homes & Gardens Davenport 2 Piece Outdoor Chairs. These chairs can stand alone, or can be incorporated into the sectional to create more seating! The bottom cushions strap onto the wicker chairs, so they don’t slide out from underneath you when you sit down. The fabric has a great linen texture and cleans up easily. I am in love with this set. It’s affordable, beautiful, and will serve our family well for years to come. A great design secret to remember that will help you effortlessly create a pulled together look is to design with a tight color palette in mind. The more colors you use to decorate a space, the more skilled you need to be in order to pull off the look! 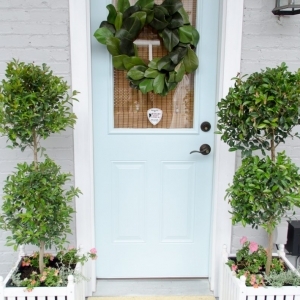 By choosing just two or three colors and staying within various shades of that color palette, you will be able to easily create a beautiful space! 3. 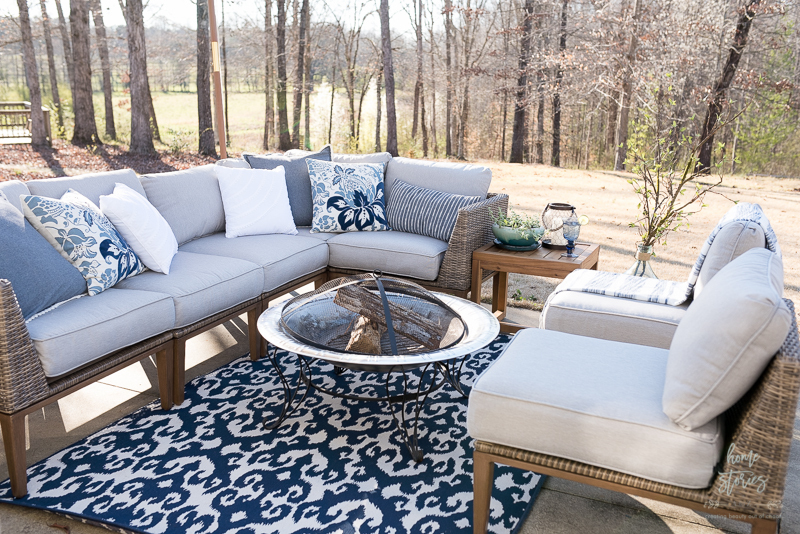 Ground your outdoor living space with an outdoor rug. 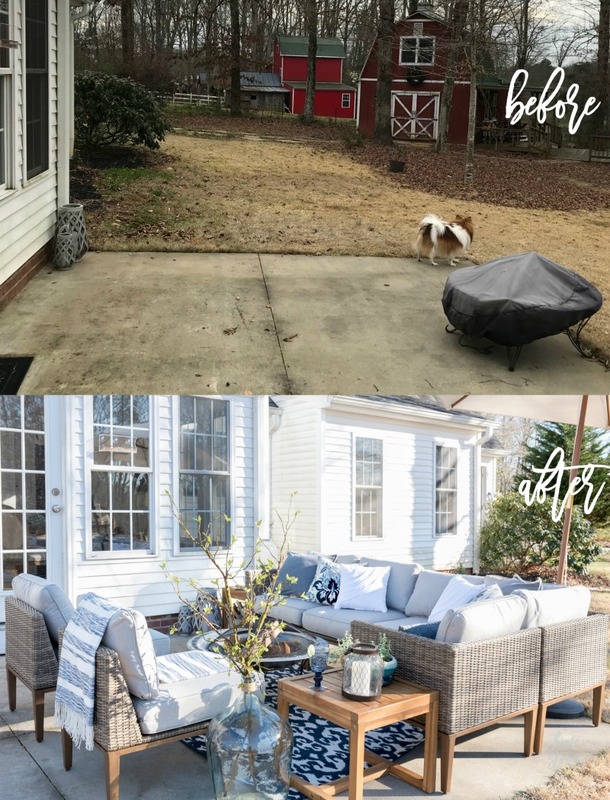 I purchased the Better Homes & Gardens Damask Indoor/Outdoor Rug last spring and knew it would look great on our patio. 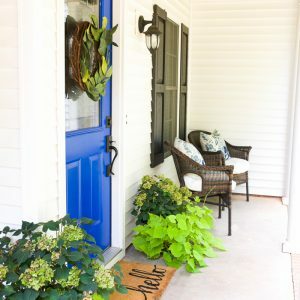 I might change it out for something more neutral later in the season, but for now I love the pop of color it gives the patio. 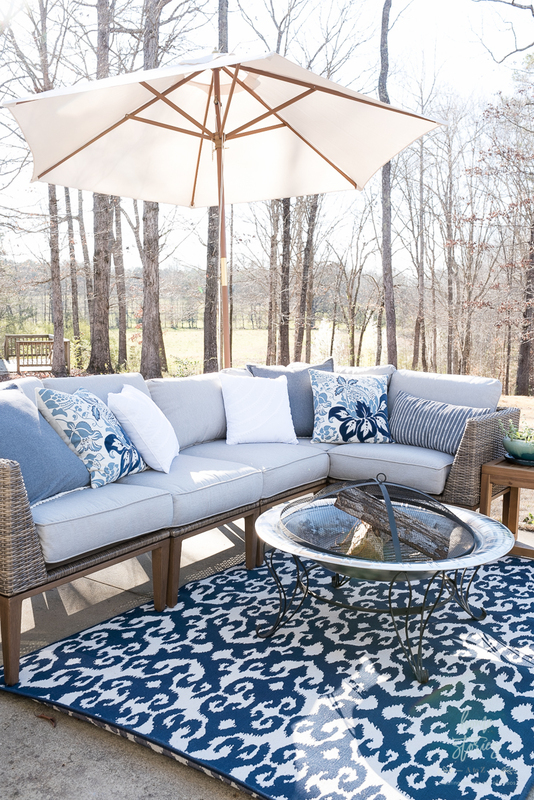 Using an indoor/outdoor rug outside is a wonderful way to ground your furniture and create the feeling of a true outdoor room. 4. Add cozy textures and accessories. 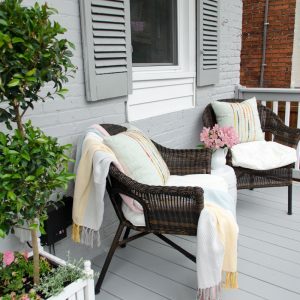 Toss pillows, throw blankets, lanterns and planters are all wonderful accessories to include in an outdoor living space. The Better Homes & Gardens Nautical Glass Lantern is one of my favorites by BHG! I own a few of them and love the chicken wire texture and rope handle. 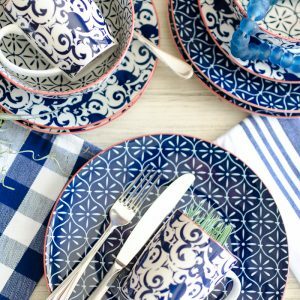 Don’t underestimate dishware as accessories! 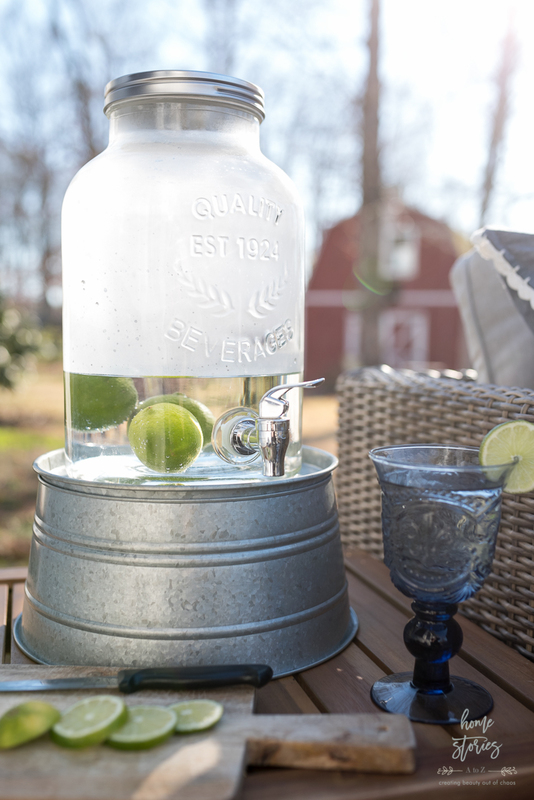 This cute Better Homes & Gardens Drink Dispenser quenches the thirst of a crowd and also looks beautiful on my outdoor table. 5. Add a fire or water feature. 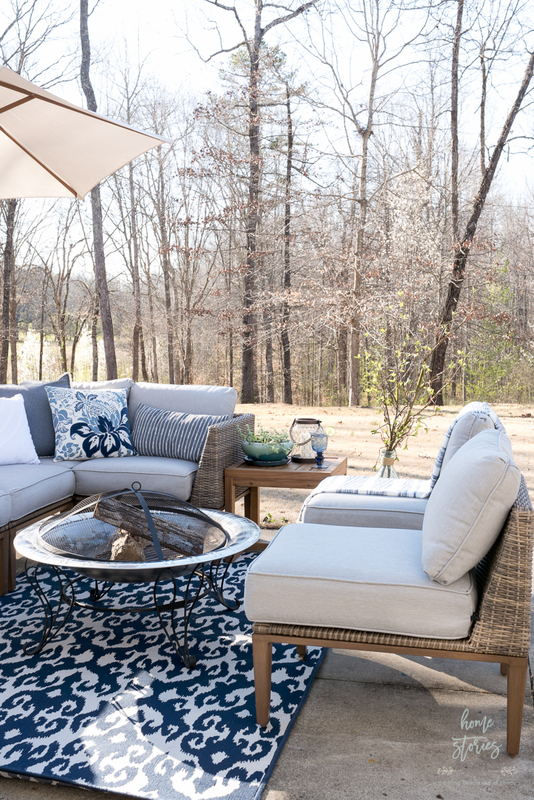 A warm and cozy fire and the sound of a bubbling water feature are wonderful elements to include in your outdoor living space! Our family loves to sit around an outdoor fire pit year-round and roast s’mores. 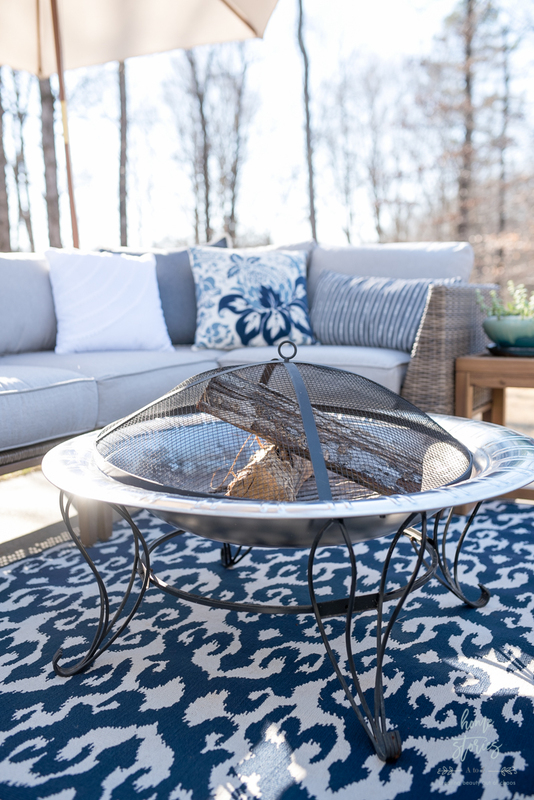 We have the Better Homes & Gardens Stainless Steel Fire Pit. It is currently showing me that it’s out of stock when I click the link, but I’ll link to some other options you might like as well here. Better Homes & Gardens has both wood burning as well as gas fireplaces in their collection. 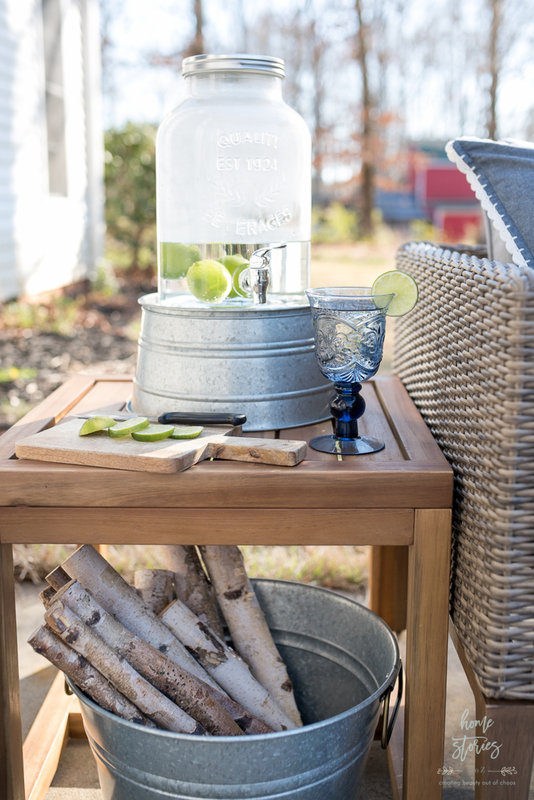 The Better Homes & Gardens Galvanized Round Tub works great to store your extra firewood or outdoor essentials! I own several and use them outdoors in the summer to store throw blankets, towels, water bottles, etc. 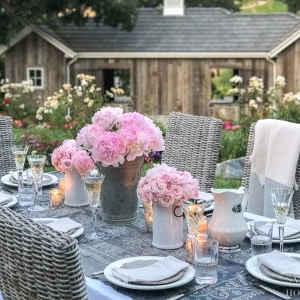 I hope these outdoor styling tips have inspired you to spruce up your own outdoor living space this spring! Spring is just beginning for us down here in South Carolina, and I can’t wait for it to soon be in full-swing. 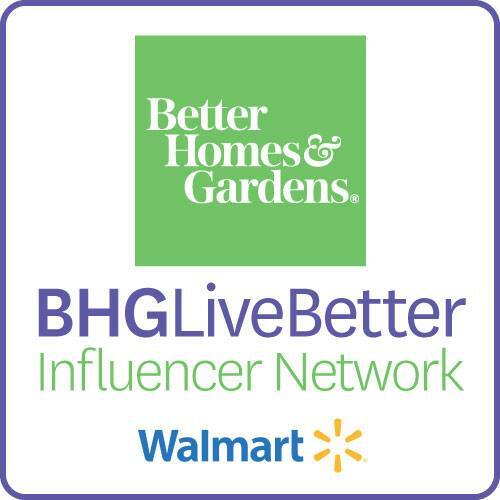 I love bringing you affordable options for your home and garden and am proud to be a part of the Better Homes & Gardens Influencer Network! Be sure to shop in store and online for their products. 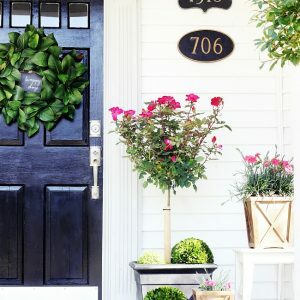 I buy most of my BHG items from Walmart.com and have them shipped to my home for free with qualified purchases. gorgeous! i love the natural color scheme and that view! This looks gorgeous! We’ve been saying we need to do our patio for 3 years now, but I’m going to make sure that THIS YEAR is THE year. We get a nasty West Wind through ours, so if things are too light, they’re gone, which is why I haven’t invested in patio furniture yet. Enjoy your patio this summer! Yes, fortunately things don’t get too windy here! My mom lives on the Chesapeake Bay and has to tether all of her furniture when not in use and then the next morning put it all back out again. It’s a pain.